Feel the glory with every visit. Once the long-track speed skating venue for the 2010 Vancouver Olympics, the Richmond Olympic Oval has been transformed into a multipurpose international centre for sports competitions, recreation, health, wellness, and entertainment. It’s also home to Canada’s only official Olympic Museum. This breathtaking venue on the banks of the Fraser River won the Institution of Structural Engineers’ top award for Sports and Leisure Structures. It welcomes thousands of visitors a month who take advantage of drop-in fitness classes or just stop by to see high-performance athletes training for (or competing in) provincial, national, or international competitions—which the Oval often plays host to. Ever wonder what it’s like to go for Olympic gold? 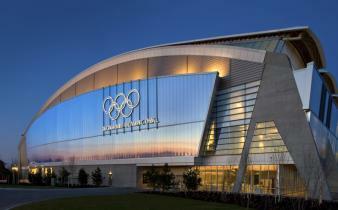 You can experience all the glory first-hand at the Olympic Experience at the Richmond Olympic Oval, the first Olympic museum in North America when it opened in 2015. 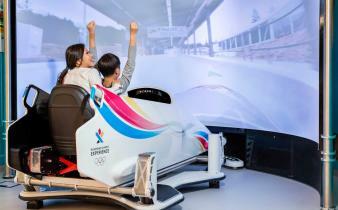 Here, you can try state-of-the-art Olympic and Paralympic sport simulators at the most interactive sports museum in North America. That means you’ll feel the rush of a ski jump, the speed of a bobsled track, and the glory of crossing the finish line as if you were doing it for real. You can also test your skills and accuracy, check out Olympic artifacts and memorabilia like medals and torches, and watch movies detailing Canadian athletes pursuing their Olympic dreams, like Pursuit of a Dream. You’ll see this 9-minute film before your tour, to give you an athlete’s perspective as they prepare for Olympic competition. It’s the perfect precursor to an epic afternoon. The Oval’s high-performance programs and services fuel sport excellence by providing world-class training, services, facilities, and technical coaching for Canada’s top athletes striving for the podium. Team Canada’s Women’s Volleyball team is based at the Oval, and if you visit on the right day, you might be able to watch them train. This iconic venue also played host to elite competitions in table tennis, basketball, wheelchair rugby, fencing, taekwondo, and more. Spectators are allowed at many of the events, so check our event calendar to get your fill.